Arsenal’s players are “frustrated” at Mesut Ozil’s injury problems. Well, so says the BBC in a view echoed by the Mail. Given the Gunners season after season of injury woes, it’s odd to think of Arsenal players being irked by Ozil’s misfortune. Jack Wilshere, Aaron Ramsay, Santi Cazorla, Laurent Koscielny and Danny Welbeck have each been injured for months at a time. What is it about Ozil’s problems that upsets them? Might this story have something to do with Martin Keown, the former Arsenal player now talking on cue for the BBC, BT Sport and the Mail? Only last week, Keown was saying that Ozil was “not fit to wear the shirt” and shedding “crocodile tears” after Arsenal’s defeat to a good Atletico Madrid side in the Europa League. Keown’s imprudent opinions and characteristic grabs for the headlines have make him a ubiquitous presence on football chat shows. Q: Do you think mental health issues are taken seriously enough in football? Martin Keown: There is a stigma attached to mental health that means people do not necessarily feel as comfortable asking for help. It can be doubly difficult as a footballer. Just because players earn huge salaries does not mean they do not suffer from the same issues and problems as everyone else… We need to recognise issues surrounding mental health as an illness, not a weakness. 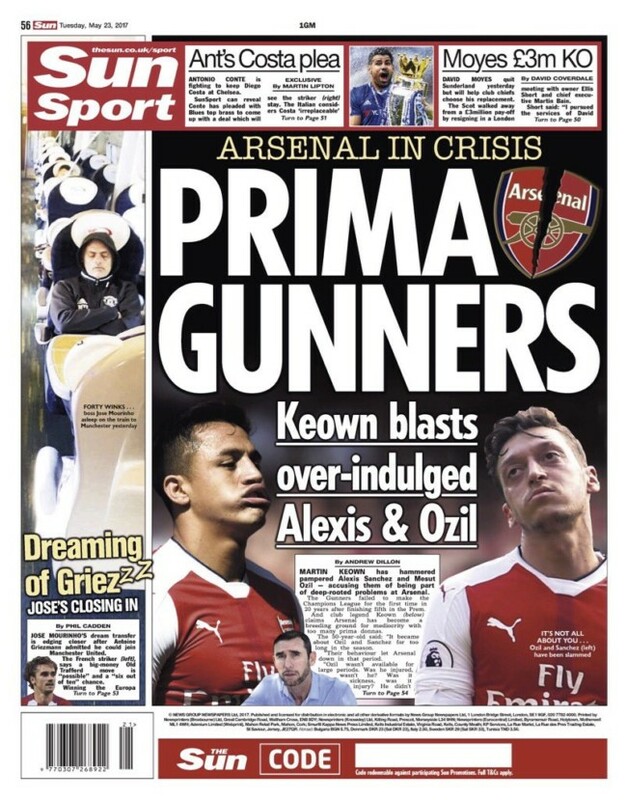 Martin Keown might be talking nonsense, but he is setting the tabloids’ new agenda? MESUT OZIL has angered Arsenal players with his shocking prima donna attitude. A number of the Gunners squad suspect Ozil is being allowed to pick and choose which games he plays in. Isn’t that what Keown said? Arsenal players are reported to be losing patience with top earner Mesut Ozil, after it was confirmed the Germany international is to be ruled out for the remainder of the Premier League campaign. SICK OF OZ-ILL – Arsenal players fed up with Mesut Ozil ‘injuries’ and prima donna attitude of Gunners’ highest-paid man. Winger is the highest-paid player at The Emirates after finally signing a new £350,000-a-week contract earlier this year.. It has not gone unnoticed that Ozil’s contribution has dramatically tailed off since he signed his new £350,000-a-week contract at the end of January.